More you use Google Plus, more peoples come into your circle. There may be a situation that you have someone in your circle who talks language that you don't understand. Also if you have joined a google plus community, you may come across foreing language updates. When you get into such a situation, what you do? If you try to use a translation service like Google Translation or Bing translation, you either have to translate a whole page, that will not work in this situation, and you try to copy and paste the single post, it is a tedious task to do it every time you come across different language. 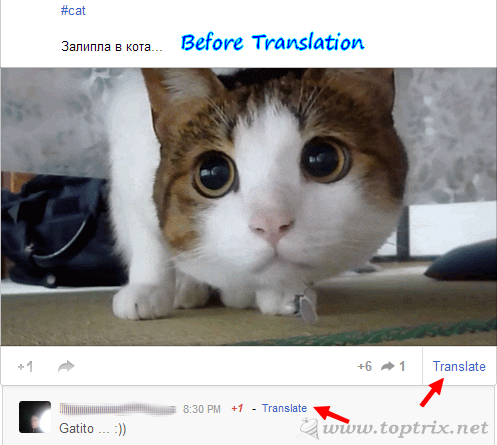 Here the Google Translate For Google+ extension for Google Chrome will come to your help. It will make your Google Plus experience unlimited. You don't have to bother to follow the peoples who talk a different language than English or anything that you do not understand. 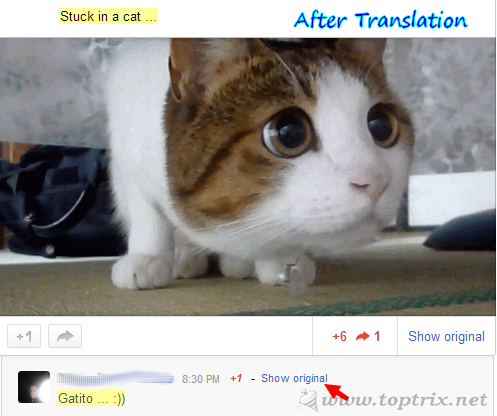 Google Translate For Google+ allow you to translate to the foreign language status updates with one click. You can either translate the original post only or post as well as comments. The translate link is embedded next to every post and every comment. You can translate the individual comment as you want. You can set the preferred language and you are done. You can easily toggle between original and translated text. Unfortunately this extension is available in Chrome only and not for Firefox and Opera. Now you can circle anyone without bothering about the language they use to communicate. Anyhow, language should not be a barrier in relation. Passionate Technology Blogger. Not a profession. Find only real life useful and simplified Tech articles, How-To's on TopTrix.